This morning, Virgil presented his debut Louis Vuitton collection at Domaine du Palais-Royal, a former royal palace. There were 56 looks in total, which included a white wool mohair suit, a quilted knit cycling top, a leather trench, fur-covered bags, monogram duffles with chains that dangled from the straps, a cashmere hoodie, and skate sneaker boots trimmed in LV monogram leather. I personally wasn’t overwhelmed by most of the designs; at times, it felt a little like Off-White for Louis Vuitton. But that almost doesn’t matter. I weirdly feel really emotional about the show. And it’s not just because he and Kanye West shared a beautiful moment at the end. Or that Kid Cudi—beaming from ear to ear—walked the show. It’s all those things, and more. When Louis Vuitton announced that it had appointed Virgil as its new men’s artistic director this past March, I didn’t know how to feel. I loved what Kim Jones, now artistic director at Dior Homme, had done at the Parisian fashion house for seven years. His designs were thoughtful, unique, and always aligned with an interesting story and reference points (often inspired by his travels around the world). Now that he was out, I wasn’t sure what Louis Vuitton under the direction of Virgil would look like, and if I’d like it. But again, nearly all of that is beside the point. 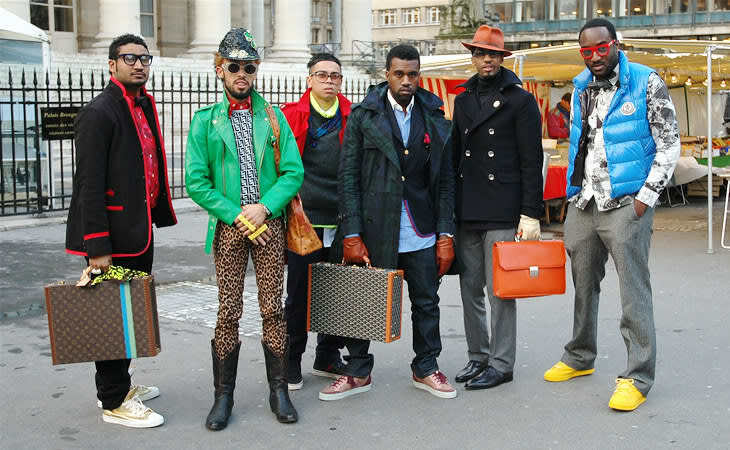 Since the show, all I’ve been able to think about is the iconic photo Tommy Ton took of Kanye, Virgil, Don C, Taz Arnold, Fonzworth Bentley, and Chris Julian during Paris Fashion Week in 2009, and what that image, and this moment, represent. At the time, those guys were attending fashion shows and (sometimes) sat front row, but they—and the world they represented (hip-hop and streetwear)—never truly felt welcome. Even when high-fashion let them through the door, they often weren’t allowed to stay for a drink. In 2013, Kanye famously told Zane Lowe that when he and Virgil interned at Fendi in 2009, they tried bringing the leather jogging pant to them well before it became a trend, but Fendi “knocked down” their idea. This past May, he also told Charlamagne Tha God that they “ain’t get to do nothing” at the fashion house. That’s how it’s been since Shawn Stussy launched Stussy in the ‘80s, or since rappers like Biggie and Lil Kim have been rapping about and wearing Versace or Gucci. The fashion industry has largely ignored streetwear and hip-hop. I can’t tell you how many times in the past I’ve had to explain what streetwear is, or how it made sense that Complex covered streetwear, sneakers, hip-hop, and pop culture. It wasn’t only until recently, as streetwear and hip-hop became mainstream, that these same people began to care. But even then, some of that attention is still ingenuine, temporary, and limited. Fashion has largely only accepted the most mainstream names, like Supreme, and often only white faces. Even as as they acknowledge rappers’ influence on fashion now (which isn’t new, by the way), it seems more like fetishization. Virgil’s appointment means a tremendous amount, not only to him, but also to his friends, peers, and people like me, who grew up on streetwear and hip-hop, and come from the same world. It was beautiful to see a designer of color leading a 164-year-old luxury fashion house. It was equally powerful to see a diverse cast of models and guys like Cudi, A$AP Nast, and Playboi Carti walk in a fashion show for a 164-year-old luxury fashion house. Or his Day 1s, the same guys in the Tommy Ton PFW photo—Kanye, Ibn, Fonzworth, Don C—sitting front row at a fashion show for a 164-year-old luxury fashion house now led by their longtime friend. To me, this feels like the single biggest accomplishment in fashion for us, for everyone who belongs to and loves this culture. Yes, Supreme won the prestigious CFDA Menswear Designer of the Year Award, but something about that recognition feels disingenuous and more of a way for the CFDA to remain relevant. While there is some of that at play here too, with his title at Louis Vuitton, Virgil will actually be able to influence and change the way high-fashion sees designers of color, the youth, streetwear, and hip-hop. Who would’ve thought that a kid from Chicago with no formal design training would get this far?